Since 2009, Auburn University Theatre in the College of Liberal Arts has created productions in the style of the Golden Age of Radio featuring the Radio Flyer Theatre Company. Under the direction of Dan LaRocque, Radio Flyer Theatre adapts beloved classics for all audiences, often with a seasonal theme. In October, the company brought a production to a live audience for the first time. 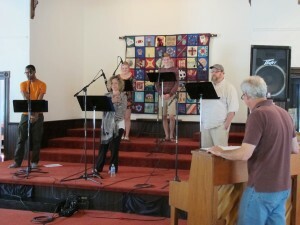 O. Henry’s “A Service of Love” and “The Green Door” were performed at the Auburn Unitarian Universalist Fellowship, featuring the voice talents of Department of Theatre students Carrie Daniel, Jordan Lunstead, Garrett Keller, Alain King and AnnaClaire Walker and faculty members Daydrie Hague and Christopher Qualls with piano accompaniment by faculty member Adrienne Wilson. The production was directed by Dan LaRocque with audio engineering and production by Kelly Walker. “A Service of Love” is a tale of a young painter and a young musician in pursuit of artistic dreams and each other in New York at the turn of the last century, and “The Green Door” is one of O. Henry’s trademark tales revolving around the twin spirits of romance and adventure in the bustling center of early 20th century Manhattan.